Ever hold your tongue to a metal pole during a lightning storm? That would be stupid...RIGHT? Yet, you're about to place a drop of Devil's Lightning on your tongue. Well, hold tight, because a bolt will shoot through your body like the Devil's rushing through you! USE WISELY!!! CONTAINS: BHUT JOLOKIA PEPPERS... Rated at over 1,000,000 Scovilles. Advantages: Has no vingar taste like the Tabbsco has and Devils Lightung has a little kick which I love about it . Disadvantages: Kinda expensive but you get what you pay for . I def. agree w/ the above reviewer. This sauce is not that hot, but it has a good taste and you can always add more sauce to your food, if you like. For a reference, I think an average person can put 5+ drops on a chicken wing w/ this sauce and be okay. I am a Mexican from San Antonio. So I know hot sauce with a kick. This hot sauce is outstanding. It's is crazy spicy but not the kind of spicy that is going to burn out your tastebuds so that you can no longer taste the flavor of your food. It has an amazing flavor along with the best lasting slow mouth burn ever! I use it both as a condiment and to cook with. 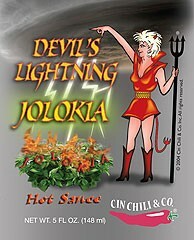 If you have a high spice tolerance and want some intense flavor, this is the sauce for you! Advantages: HIGH spice level. HIGH flavor profile! Disadvantages: Not for those with mild spice tolerance.